Flag is a holy item that has significant importance. The term ‘flag’ was first coined by Dr. Whitney Smith in 1957. The study of flags, also called as Vexillology has its origin from the Latin word ‘guide’, which continues to hold relevance in the use of flags today. Flags were portrayed as common symbols in history for thousands of years. Regardless of the location or reason, a flag design is made with a careful thought, and the colors applied in its foundation symbolize far excellent ideals than what is visible on a simple color wheel. 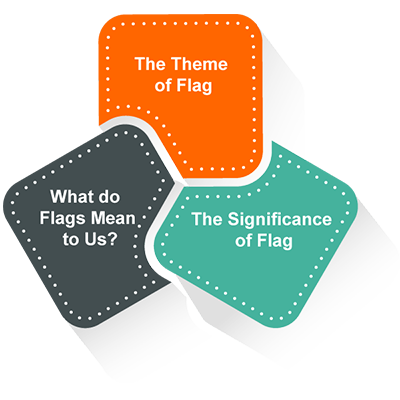 Flags have high degree of importance based on the context in which they are being used. They are often associated with the army, national integration and regional pride; and more regularly on a government organization or a company logo. What do Flags Mean to Us? In earlier times, flags were valued as symbols – wins and defeats or to convey signals to friends and enemies. In present society, every nation (and often, several states within) in the world flies a symbolic flag. A large number of families, companies and sports teams carry designed representative flags. Product packaging, clothing and propaganda posters all bear the hallmarks of flags. Flags were attached with religious importance too. For example, emblems were used as flag posts of chariots during the time of the Kurukshetra war in India. The colors and icons of each flag depict the ideas/values/ambitions of the nation or an organization. While a white flag is known as a symbol of surrendering that protects one’s life by waving it during, a red flag denotes danger. A coffin covered with a national flag conveys the country’s greatest respect for the departed souls. Usually, the national heroes who made top contributions to the nation’s growth and unselfishness sacrifices during war earn the privilege of having their coffins swathed with national flags. Provided below are some categories of blogs, which carry variety of significance. They represent history, military forces, businesses, civilians, diplomatic community, governments, sports bodies, nations and more. The Olympic Games symbol that came about in 1920 bears five rings that symbolize five parts of the continent comprising Africa, Europe, Australia, Americas, and Asia. 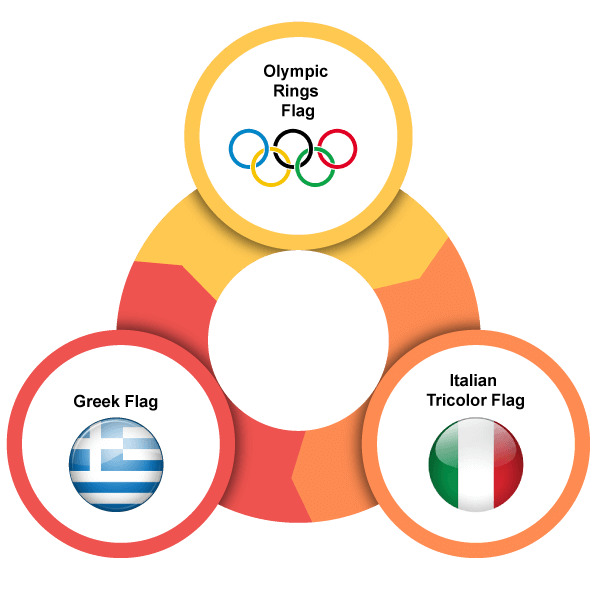 Specifically, five flag colors were chosen as they reflected the colors of all national flags in existence during the time the Olympic flag was conceived. This flag design, the source of pride and motivation for athletes, was first developed by the French educator Pierre, baron de Coubertin who gave wings to the birth of the modern Olympic movement. Commonly known as the “blue-white”, the Greek Flag combines 9 stripes that mark the nine syllables in the famous Greek phrase of “Freedom or Death”. The iconic flag of white and blue conveys about sunny vacations and beaches. The white cross in the top left corner represents the Eastern Orthodox Christianity that is widely recognized religion of the country. Towards the end of 18th century, different Italian regions adopted a tricolor flag consisting of vertical bands with green, white, and red colors. The colors bear a resemblance to the uniforms of many German states. The square-shaped flag was inspired from France that had influence over the areas. Mostly, flags all over the world are based on cultural or regional sources. Some nations have brought in certain protocols into legal system whereas others like to have “guidelines” without any riders like criminal or civil consequences. The nation’s flag in majority of instances, is fluttered on the center mast, to a great extent. The most significant factor in hanging a flag is ensuring the flag doesn’t touch anything like trees, bushes, gutters, and sidings when it flutters. Any sort of touching will spoil the flag. When two poles are intersected, the point of honor is the flag that culminates on the left side from the angle of an observer. 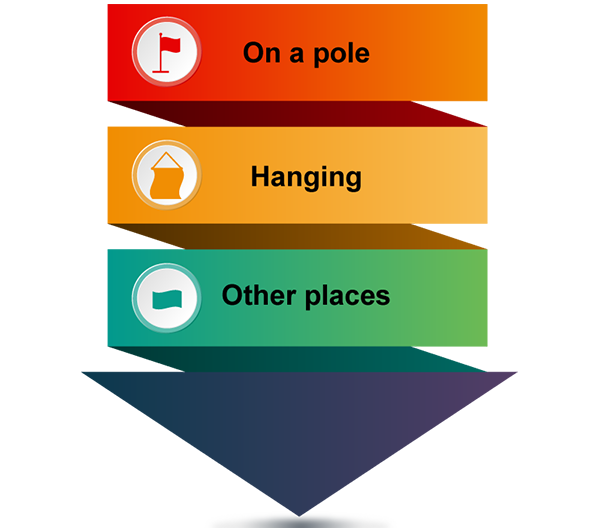 When hung horizontally, as from a flag post, the flag needs to be oriented so that the area is in proximity to the top of the pole. While displaying on a wall, the area would have to be in the top-left corner from the angle of the observer. When placed at a podium or at worship places, the flag should hover exactly behind or on a pole to the right side of the speaker. On a vehicle, the flag should be put up securely on a window of the vehicle. Where a visiting dignitary Head of Government shares a car with the native Head of Government, the host’s flag takes the nearside position with the guest’s flag on the offside. When flags of several countries are hovered, the flag of the hosting nation should be positioned on the right with the rest coming in alphabetical order in respective languages of the host country. The flag of any sovereign country should not be displayed over that of another, except when the countries have locked horns with each other. The flag of the country has a specific protocol and is managed by the Flag Code of India, 2002, the Emblems and Names (Prevention of Improper Use) Act, 1950 and the Prevention of Insults to National Honor Act, 1971. Showing disregard to the national flag is punishable by law with a jail term of up to three years, or a penalty, or both. The specified official regulation states that the flag should never touch the ground or water or should not be used as a cloth in any form. Discarding spoiled flags is also enshrined in the flag code. Damaged or mutilated flags should not be tossed or deliberately spoiled. They are allowed to be spoiled as a whole in private, by flaming or through alternate method in appropriate to the honor of the flag. Conclusion: Flags are not only integral to national identity but serve as the means of communication too. They stand as the pride of historical places, national flowers, and historical figures.